President Donald Trump visited a Veterans Affairs facility in Las Vegas on Friday, signing a bill to fund the military, Veterans Affairs, and other key infrastructure. 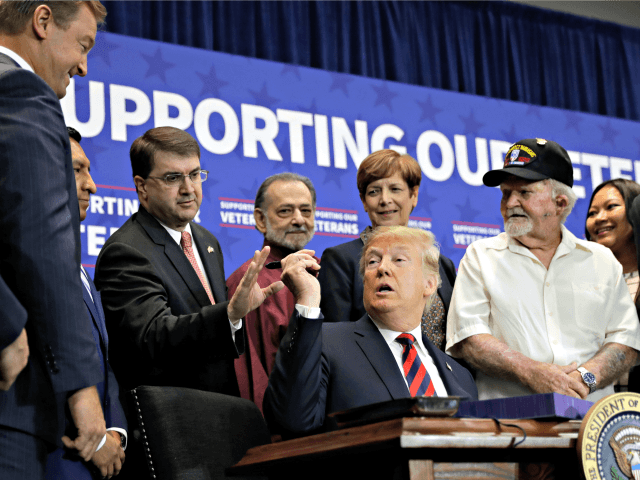 The president hailed the success of the VA Choice Act, allowing veterans to seek private doctors if they faced long lines at the VA facilities. He called Vincent Putignano, a disabled Vietnam veteran Marine from Las Vegas, to the podium to talk about how he used the VA Choice Act for some of his care. After looking at the president, he joked, “I think a couple of us in here are too.” Putignana chuckled while Trump grinned. The veteran said that the VA Choice Act allowed him to find a private doctor to operate on a bleeding ulcer on his toe. Trump signed the legislation funding the military during his visit, promising to continue supporting veterans. “Today’s legislation is one more promise that the Trump administration is keeping,” Trump said. The president noted that the Veterans Affairs budget was at it’s biggest ever and promoted recent reform legislation to give veterans more choice and to make it easier to fire bad actors in the system. Trump thanked his new Veterans Affairs Secretary Robert Wilkie for his service in the administration, noting that Gen. Jim Mattis was sad to lose him at the Department of Defense. “He’s had a lot of fun, we take care of our good ones, and we hold the others accountable,” Trump said, referring to Wilkie. Wilkie thanked Trump for placing veterans at the top of his campaign. “President Trump is the first candidate and the first president to put veterans at the center of his campaign,” he said.